Malai Cha: What Is It And How Do I Make It? Otherwise known as masala tea, malai cha is a beverage that is made brewing black tea with aromatic herbs and spices. Its origins can be traced to the Indian sub-continent and due to its worldwide popularity, malai cha is a major feature in coffee and tea houses. There is no fixed recipe for making malai cha and most families have their own versions. Tea leaves are usually steeped in hot water, just long enough to extract bitter flavor. Due to the immense number of variations, malai chai is generally considered a class of tea and not a specific kind. There are four basic ingredients in every malai cha recipe i.e. milk, ginger, cardamom and sugar. The base tea used to make malai cha is a strong black tea so that it isn’t overpowered by the spices and sweeteners. People who are obsessed with earl grey tea can try this malai cha once and they are going to love it. The traditional malai cha is a spiced beverage made with different proportions of spice mixtures known as karha. Ground ginger and green cardamom pods are used as the base for the spice mixture, but one can use additional spices like star anise, cinnamon, peppercorn, fennel seeds, cloves and nutmeg. There are different choices when it comes to sweeteners. Common options include plain white sugar, coconut sugar, syrup, brown sugar and honey. Jaggery is also a popular sweetener, particularly in rural parts of India. Outside India and South East Asia, some coffee houses prefer to use commercial liquid concentrates rather than brew their tea from scratch. Western supermarkets offer teabags that contain an assortment of ground malai cha spices. These require steeping in hot water to make instant malai cha. Cold cha beverages are quite common in the United States and a great alternative to hot tea. They range from simple malai chai without milk to a slush of spiced tea with ice, milk and topped with whipped cream. Non-traditional ingredients occasionally used to prepare malai cha include chocolate and vanilla. Malai cha has a high nutritional value. The calorie count is well below 100 and if consumed without sugar or milk, it has 0% fat content. As such, malai cha is recommended for all age groups. It is packed with flavor and has been known to help with weight loss. The anti-bacterial and anti-fungal properties of malai cha help prevent nasal congestion. Ginger and cloves boost immunity, thus keeping you a cough away. Spices used in malai cha boost energy, immunity and have anti-oxidizing properties. They also aid in digestion and help prevent problems associated with blood pressure. 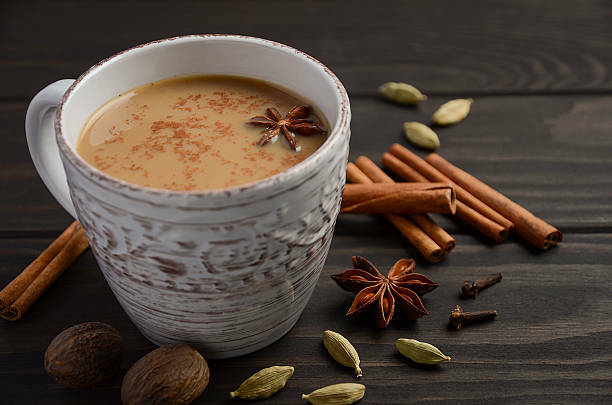 All you have to do to make a cup of malai chai is take some crushed clove, cinnamon and cardamom in a bowl. Add pepper and ginger then boil all of the ingredients in water. Allow the mixture to steep for five minutes then add a little sugar and milk to the mixture. Allow it to boil before adding black tea and pouring into cups. This is the most basic method of making mala cha, and one can make it however they like. As mentioned before, there are different ways of making mala cha. Why stick with one recipe when there is a whole lot of spices and sweeteners at your disposal?